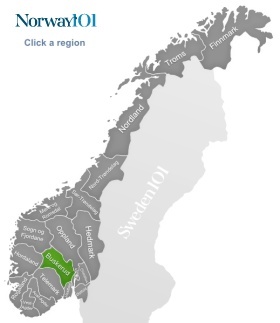 Buskerud is a region that is mainly known for its high-tech industry and the coin minting in Kongsberg, the great skiing areas, the woodlands, and the mining history. If you have tracked back some ancestors to Buskerud, then it is quite likely that they either had to do with mining or the timber and paper mill industry (which are both still a major player for the economy of this Norwegian region). In Buskerud, you can take tours old mines, take long hikes, go skiing, or simply enjoy some of the fine museums that take you back in time. Drammen used to be an important center for the production of timber and paper. The paper mills are closed now, and the city is slowly moving from its rather drab image to a nicer image. The city is now promoting itself as river city, and does so rightfully. Drammen has one of Europe's largest town squares, a museum with ever-changing exhibitions, a renaissance theater, and an interesting pedestrian bridge over the river Drammenselva. People who visit Drammen usually have the intention of exploring the area surrounding Drammen, and a good way to do so is to use the Spiralen, which is a corkscrew-shaped tunnel in the hills. It takes you up to the top of the hills, and you'll get some very nice views from up there. It is also a fantastic position to start some hikes from. If you would like something more exciting, then you could head to the Kjøsterudjuvet. That gorge is 10,000 years old, and a great place to do some gorge jumping. Geilo is the place to go to if you like skiing, because the small town is mainly used as a ski resort. In the warmer months of the year, it turns into a popular place for people who want to hike in the mountains – so it is mainly a place for people who would like to be active and enjoy the wonderful mountain scenery at the same time. While Geilo is a quite small town, it offers you everything you need: from supermarkets to a cinema and the typical tourist shops. Dr Holms, Norway's most famous hotel, is also located in Geilo. Hemseldal is also relatively small, but it is located in Norway's second largest alpine skiing area, so in winter it's great for winter sports, and in summer it's a fantastic place for people who would like to go hiking in a typical Norwegian landscape. If you like high mountains, rivers, and beautiful waterfalls, then this is a great place to spend some time in. However, if you would like to learn a bit more about heritage and culture, then Hemsedal also has a lovely museum in a restored courtyard. The guided tours are great if you'd like to learn from a local. Hønefoss is often wrongly translated as “chicken falls”, while it actually means “hen-waterfall”, but we don't have to be too strict about. In the end, it kind of means the same. The waterfall itself is in the town, but if you have seen waterfalls before, then it might not be the most impressive one you've ever come across. The river runs through a paper mill before it turns into a waterfall, so you might also notice that it does not quite smell like normal water is supposed to smell. How nice it looks also depends a lot on the time of the day you go to watch it. 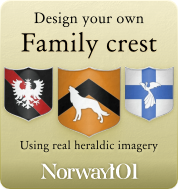 In general, Hønefoss is a great place to use as a base if you like forests and nature. There is a lot of woodland in the area around Hønefoss, and it's ideal for camping. Kongsberg once used to be the second largest German town in Norway. It has been founded in the early 17th century because silver was found in the region, and German miners were brought in to do the silver-mining. Since 1686, all Norwegians coins are minted in Kongsberg, but silver-mining stopped in the mid-1900s, and the town is now known for its advancements in high-tech. Today, Kongsberg is also a great place to learn about the history of mining in the area, and the impact it had on the people. You can take guided tours of the old silver-mine and visit a mining museum. The Lågdalsmuseet in Kongsberg is also a great place to learn about heritage and culture. It's a place in which you can see old buildings and learn what life was like in the past.